We are blessed here at Care at Home to have so many wonderful Caregivers! Each month we tackle the difficult question of who to name as our Caregiver of the Month. 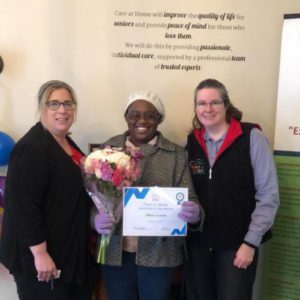 Congratulations to Oldine L. for being selected as Care at Home’s Caregiver of the Month for January 2019! Darcie M, Oldine L., and Jodi W.
Oldine was selected as this month’s recipient because of her unyielding dedication to her clients. Oldine displays an attitude of caring, kindness, and personal interest to each client she cares for. She never hesitates to assist the office with covering cases last minute. 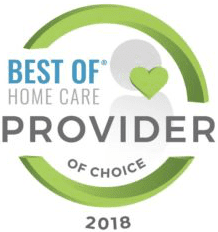 Care at Home knows wherever she is placed, she will work her hardest to endure that out client is taken care of physically, mentally, and emotionally. We are truly fortunate to have a Caregiver like Oldine as part of our team, and there are not enough ways to thank her for her service.